Soapy clay recipe is a no cook cold porcelain clay suitable for miniature fruits, flowers and other small objects. It will dry hard with smooth finish. I like this clay because it smells good. Some of you may ask, why we use soap. Well, beside for the fragrance the soap is actually somewhat preserve the clay. It keeps the clay fresh for few days. But if the humidity level in your place is high, the clay will still be moldy if you don't keep it in the fridge. Honestly, this clay is good if you use it all within 2 or 3 days. So, make a small batch - just enough for your crafts on the day you make them. 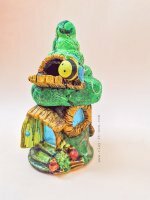 How to make Soapy Clay? 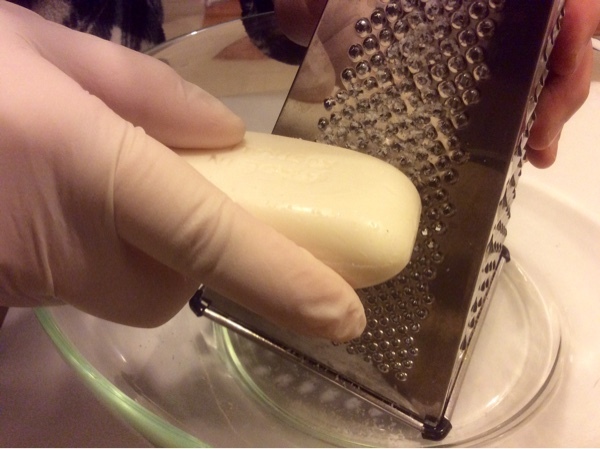 Use grater to grate your soap (for fragrance clay, use fragrance soap). Slowly add hot water until grated soap soft. Add tapioca starch little by little and mix it with soap in the bowl or plastic tray. Knead well about 10 minutes until it didn't stick to your hands anymore. If it does, add a little bit of starch again. Add 1 tbs of glycerin or just enough to make your clay softer and to prevent it from cracking especially for places with low humidity level. Your soapy clay is ready! Wrap your clay with plastic wrapper and keep it in the air tight container. We've also prepare video tutorial for you as below. Use new stock of tapioca starch. Do not use oil when kneading the mixture. Use only good quality soap. Check your local Asian grocery store for tapioca starch. The clay contained soap but shouldn't be used as normal soap when it is dry. It should be used as decorative items only - not for skin/ body.